Did you say an all female cast?! “THANKS to the remake of Ghostbusters with an all women cast, the world is being forced once again to listen to one of the most tired, insulting and wrong-headed statements ever made: women aren’t funny”, reads the article in the Herald Scotland defending funny women. 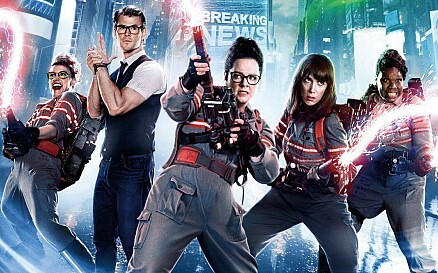 When the movie remake of Ghostbusters was announced many focused on the fact it was an all-female cast. 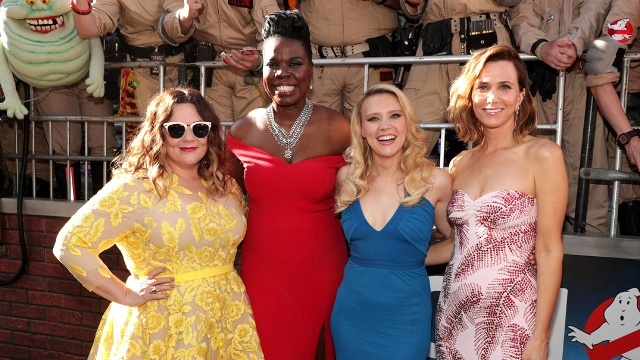 Melissa McCarthy, Kristen Wiig, Leslie Jones and Kate McKinnon all lined up to star in the movie. Many individuals cried out in contempt at the idea of women suiting up to fight ghosts (the idea was more difficult to comprehend than the tangible existence of ghosts). They argued that the notion would tarnish the original film and ruin their childhood. In the run up to the movie release, which happened on Friday, the ladies set about promoting the movie on various chat shows in the US and the UK. It was while sitting down to watch the Graham Norton Show that I came across the cast and was introduced to all the starts together chatting about Ghostbusters. Already a big fan of Melissa McCarthy I was pleased with the show’s line up. And I was not disappointed. The funny foursome demonstrated quick wit and smart one liners that had me laughing out loud. I had not heard of Leslie Jones before but was very impressed with her comedy and her tale of how she decided to become a comedian. She impersonated her father’s response to her new career idea: “WHO TOLD YOU YOU WERE FUNNY? !” He demanded to know. The conversation was refreshing and I believed the all gal cast (especially one of this calibre) would open up a whole new audience for the Ghostbuster franchise. A fan looking up in awe at Kristen Wiig, female Ghostbuster. 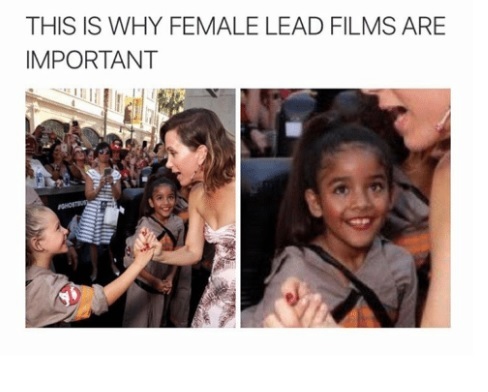 I had dismissed the outcry about women being inadequate to play the four ghostbusters, I thought who even has that mentality that women shouldn’t be the main characters of a comedy? And watching the female cast interact with Graham Norton and the audience confirmed for me that woman comedians should be celebrated. Who could watch this and not smirk, giggle or laughed out loud? You can see for yourself by finding the Graham Norton show on catch up – it is series 19 and episode 13. If you don’t wanna watch it all – here’s a quick clip of the chat show! However the faint cries snubbing the Ghostbuster remake became louder on Twitter as Leslie Jones received numerous abusive tweets and racist messages. She responded by accepting people can hate the movie but stating there is no need for the direct abuse she has been subject to and calling for Twitter to impose stricter guidelines. She wrote: “I leave Twitter tonight with tears and a very sad heart. All this cause I did a movie? You can hate the movie but the abuse I got today is wrong”. You can read an article that shows some of the horrendous messages Leslie received. Women can do anything they set their minds to (fact). However the anger shown towards the creation of an all-female comedy demonstrates that women are subject to doubt, criticism and discouragement. I had to involve myself in the discussion surrounding Ghostbusters, Leslie Jones and the “misogynistic attention” the remake has received as I was in disbelief it even was a topic for discussion. Through the Women’s Fund for Scotland I am reminded of the various obstacles women face in today’s society and culture. I want to acknowledge that yes, there will be challenges in achieving gender equality and people may not always share the same viewpoint that women can do anything at all (and also – if you do not have anything nice to say – don’t say it at all). But as long the supporters of women stand up and stand together we have a strong chance of out-shining the hatred. Women have to be encouraged to reach their full potential. When subject to negativity, it is important to remember to stay strong and remind yourself of all those individuals who are rooting for you to succeed. Here at the Women’s Fund we strongly support all women and girls and those who support feminism and gender equality. We are dedicated to supporting each individual reach their goals.